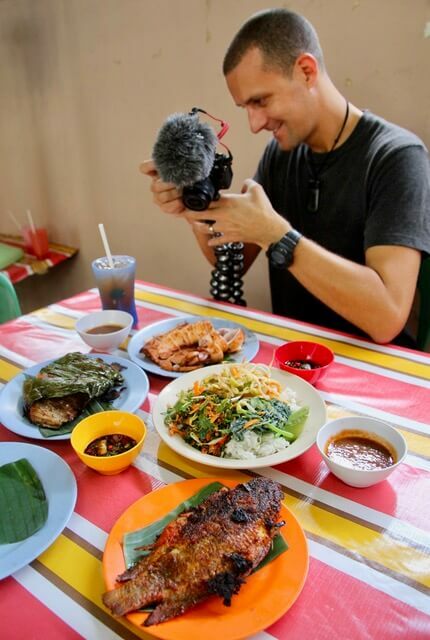 If you love to eat then add Kuala Lumpur, Malaysia’s dynamic capital city, to your travel bucket list. The food culture is vibrant and diverse- a melting pot of Malay, Chinese and Indian cuisine that is best experienced in small, family run restaurants and on the street. Street food is about spectacle- billowing smoke, the clang of the wok, the hiss and roar as food is dropped into hot oil. You’ll find plenty of spectacle at Huen Kee, a third generation owned and operated family restaurant specialising in claypot chicken rice. The pavement outside the restaurant is where all the action takes place. 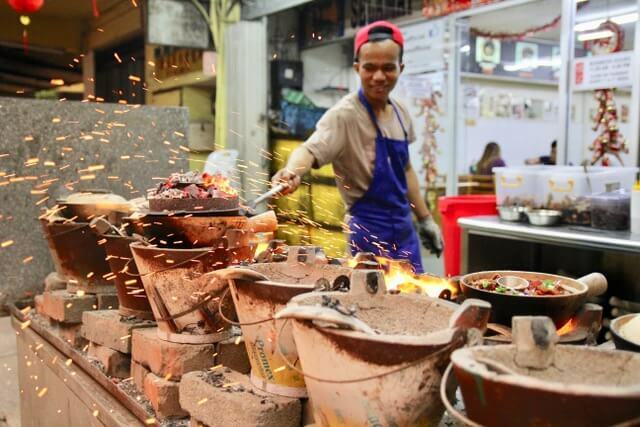 Cooked to order, claypots are filled with rice, chicken marinated in soy and rice wine and lap cheong (Chinese sausage) and cooked over charcoal burners which send delicious smoke spiralling into the air and sparks flying. The resulting dish is smoky and intense, the chicken melt in your mouth tender. For extra umami add salted fish to your order and make sure to mash it up and mix it through the rice. And finally, don’t even think of putting down your chopsticks until you’ve scraped away every last bit of the rice crust that has formed on the bottom of the pot. It’s the best bit! Huen Kee Claypot Chicken Rice, 59, Jalan Yew, Pudu, 55100 Kuala Lumpur. Open 11:00am to 9:00pm. Closed Thursday. Hailing from the northeast state of Kelantan, nasi kerabu might just be the country’s most Instagrammable dish. It looks good but it’s the unique flavours and textures that make this dish worth hunting down. This Malay favourite is made up of a pile of pale blue rice (dyed with the petals of the butterfly pea), toasted coconut, raw shredded cabbage and beans, crispy fish crackers and half a salted duck egg. Eat it at Zul Nasi Kukus a ramshackle street stall located in the heart of Little India- it’s cramped, hot and a bit grubby but they churn out an exceptional nasi kerabu. Don’t forget to add a piece of fried chicken on the side- it’s a must. Zul Nasi Kukus , Jalan Padang Belia, 54700 Brickfields, Kuala Lumpur. Open for lunch. Here’s an opportunity to sample one of Malaysia’s most popular snacks together with South East Asia’s most famous fruit. Nothing beats the heat like a cold bowl of cendol, a dessert made up of shaved ice, coconut milk, pandan flavoured mung bean flour noodles and gula Melaka (coconut palm sugar). At this stall they top each bowl of cendol with a generous lobe of durian. To say durian is divisive is an understatement, you either love it or you hate it. Its pungent stench can be recognised a mile away and the fruit is banned from public transport and most hotels. If you’ve never tried durian, don’t let its potent aroma put you off- it has a creamy, custard like texture and its flavour is floral, savoury and reminiscent of onion (in the best possible way). Combining these two cultural icons is genius- don’t leave KL without eating both! Cendol Durian Runtuh ,57, Lorong Raja Bot, Chow Kit, 50300 Kuala Lumpur, Wilayah Persekutuan Kuala Lumpur. Open daily 3:00pm to 3:00am. Ikan bakar literally translates to burnt fish. Doesn’t sound too appealing does it? But trust us, this is one fish barbecue you don’t want to leave off your eating itinerary. Nestled in tropical jungle in the heart of KL is a cluster of restaurants all specialising in ikan bakar where seafood is smeared in a sweet and spicy paste before being wrapped in banana leaves and grilled. You feel as though you’re in a kampung(village) eating here. The bustle of the city falls away as you sit at the communal tables pressed shoulder to shoulder with your fellow diners feasting on squid, stingray and mackerel. Grab some rice and vegetable sides from the buffet to accompany your seafood and enjoy one of Malaysia’s most popular meals. Kak Jat Ikan Bakar off Lorong Bellamy & Jalan Istana, Bukit Petaling, 50460 Kuala Lumpur, Open Monday to Saturday 10:00am to 3:00pm. 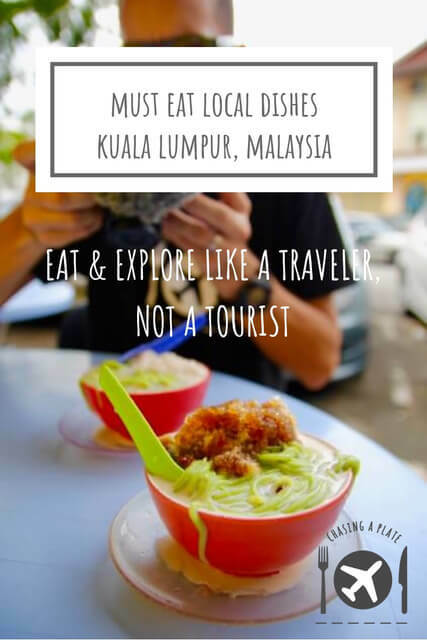 We hope this Kuala Lumpur food guide has helped you eat and explore like a traveller, not a tourist! Watch our Malaysia videos below. Subscribe to our YouTube channel for new videos every week!